Power Solution Industries offers a comprehensive range of cable tray and ladder products conforming to BS EN 61537 and NEMA VE1. To design a safe and economical system, it is necessary to consider all the loads applied to the system and establish the criteria by which it will be judged. 1. The capacity charts provided in this catalogue assume that loading is uniform, both along length and across width. If a point load is applied to the tray / ladder it will potentially have a significant effect and this must be quantified. 2. If components are incorporated in an exterior installation there may be other loading factors to consider, such as wind, ice and snow. Cable tray & ladder acts as a structural load carrying beam when installed horizontally. The loads imposed and the type and location of supports will create a pattern of bending moment in the structure. Stress will be induced and deflections (vertical displacements) will be observed. A properly specified system will ensure that the stress does not exceed to that which is safe for the materials used in the components. A suitable installation will require choice of appropriate style of tray / ladder and the location of supports. Increasing the span (horizontal distance between supports) will always reduce safe load carrying capacity and increase deflection. 1. Bending moment is much larger in the end spans of the continuous beam than the intermediate spans; which will reduce the load carrying capacity in the end spans. If an installation requires full load carrying capacity along the whole length, than full capacity of the intermediate spans can be used if the end spans are reduced to 0.75L (length of intermediate spans). 2. Bending moment is zero at approximately 0.25L either side of the intermediate supports. These are therefore ideal places to locate connections between component lengths of cable tray/ladder. The installer should avoid placing connections in mid-span positions and at supports. These are positions of maximum bending moment. 3. 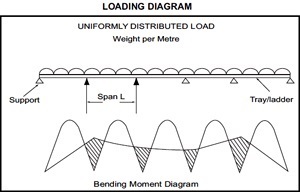 The diagram shows a typical multi-span beam loading condition. If a loading condition occurs where there is only a single span loading condition it can be taken that the permissible load is reduced to 0.5 that shown for intermediate span in multi-span beams. 4. Only straight length beams are discussed above. When accessories (bends, tees, risers etc.) are involved in an installation they will require extra local support. It is always recommended to use fish plates in conjunction with connectors, particularly when cable trays of greater than 200mm are used. Where earth continuity is an important consideration in a cable tray or ladder system, bonding jumper leads should be used. 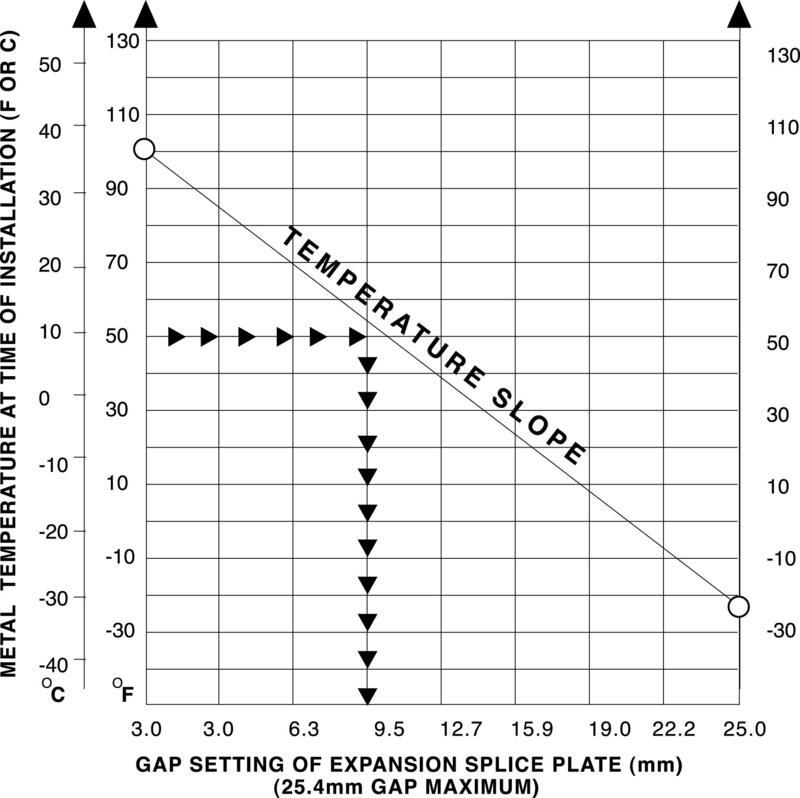 Cable ladders runs exposed to wide ambient temperature & the variation should incorporate expansion connectors. Installation of cable support and cable management systems must consider thermal expansion and contraction. The cable ladders & trays should be anchored at the support nearest to its midpoint between the expansion splice plates and secured by expansion guides at all other support locations, refer to Figure 1. The cable ladders trays should be allowed longitudinal movement in both directions from that fixed point. Supports should be located within 600mm each side of expansion splice plates.